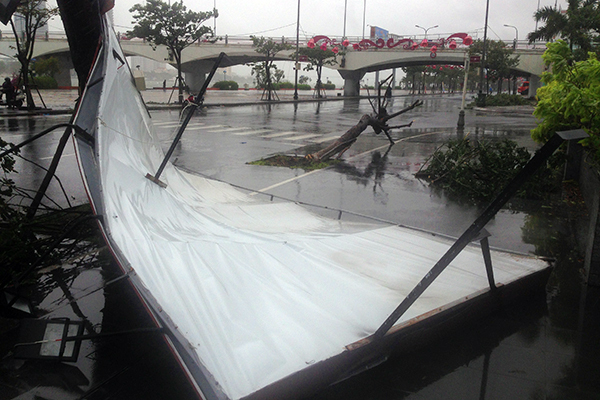 DA NANG (VNS) — Tropical storm Vamco, the third storm over the East Sea this year, struck the central Quang Ngai Province's Ly Son Island with wind speeds of 62km to 74km per hour. It then weakened into a low pressure front after making landfall in Quang Nam and Quang Ngai provinces around 11pm yesterday. The storm also brought rainfall of 50mm to 70mm in provinces extending from Ha Tinh to Quang Binh, resulting in high water levels in the rivers flowing from Quang Tri to Binh Dinh. Vice-Chairwoman of Ly Son Island District People's Committee Pham Thi Huong said the storm caused a 20-minute blackout on the island. About 200 tourists were stranded on the island yesterday as passenger boat services were suspended due to the storm. All students in the central Da Nang City and in the provinces of Quang Nam and Quang Ngai had a day off yesterday. The Border Guard High Command said five boats -- two from Quang Binh Province and three from Da Nang City -- sank because of strong waves yesterday morning, while reaching shelters or lying anchored at shelters. No loss of human life at sea has been reported so far, the high command said. Dyke Management Department under the Agriculture and Rural Development Ministry said there have been no reports of dyke problems so far in the storm-hit provinces. Vietnam Airlines (VNA) and Jetstar Pacific yesterday cancelled a total of 27 flights because Storm Vamco. The National Centre for Hydrometeorological Forecasting said the central provinces extending from Quang Binh to Quang Ngai and the Central Highland Province of Kon Tum would continue to receive rain till tomorrow. The northern-central provinces extending from Thanh Hoa to Ha Tinh and the Red River Delta provinces will experience heavy rain till Friday. The Storm and Flood Prevention and Rescue Centre's Central and Central Highlands Office warned that the water level of rivers flowing from Quang Binh to Thua Thien-Hue, including Gianh, Kien Giang and Ben Hai, would rise fast from 3m to 7.9m today.